Note: I took a lot of notes for this post, but never actually wrote it up. Here, for posterity’s sake, is my writeup on my stay in Chicago. We were scheduled to arrive in Chicago around 8:55 the next morning, but according to our porter, Herman, thanks to snow and a broken rail we were running about three hours late. Of course, by now that didn’t bother me. Compared to being fourteen hours late to Orlando, three hours was nothing. And in reality it was a good thing: by the time I got to my hotel my room was ready (presumably it wouldn’t have been ready three hours earlier). Upon disembarking I immediately headed to the taxi stand and took a cab to my hotel. I wasn’t all that familiar with Chicago, but knew that my hotel, which was close to Northwestern University, was too far from the train station to walk to. When arranging the trip I had booked in at another Doubletree: the Doubletree Guest Suites Chicago-Downtown. For $129 per night I got a “King Deluxe Suite” which was indeed deluxe: it had a huge living room with a TV, and an even larger bedroom with a king sized bed and a second TV. I almost cried when I saw the bathroom: it was probably as large as my entire room in New York City (for which I had paid $120 per night). By this point in my trip I was exhausted, and I had no more clean clothes. Here was a chance to luxuriate in relative comfort and to wash up some socks, underwear, and shirts (in the tub; I had a nice sized bathtub!) and prepare for the final journey home. Of course, I had planned for Chicago to be more than just a waypoint between New York City and home: it is a destination in its own right. I arrived on Wednesday morning and wasn’t scheduled to leave until midday on Saturday. Thus, I had about 72 hours to explore the city and perhaps do some last-minute shopping for those back home. That first day, after checking in and spending some time resting in my room, I took a brief, exploratory walk around the immediate area with the primary goal of finding an ATM where I could replenish my dwindling cash supply. I stepped outside the hotel that afternoon, and brrrr—was it ever cold! Fortunately, my London Fog coat, with the lining zipped in, and gloves were exactly what I needed. I actually wore my overcoat over my sport coat; it was cold enough that I needed the extra layer. 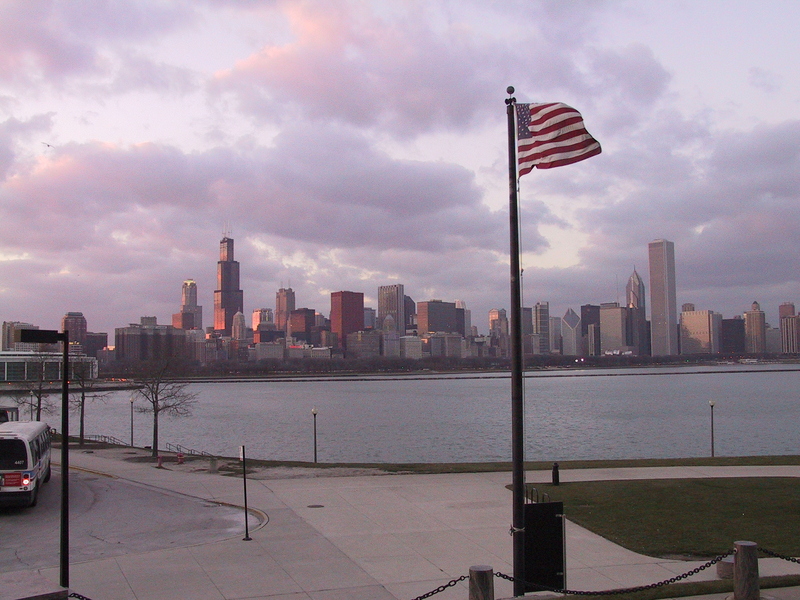 They don’t call Chicago “the Windy City” for nothing, and on a cold day like I was experiencing the wind chill makes things significantly worse (okay, while the term “Windy City” may not have originated from the winds coming off the lake, these days that is how most people interpret it). Fortunately, I only had to deal with cold and wind: it was neither snowing nor raining, so I didn’t have to play Mary Poppins in those windy conditions. It wasn’t too long before I found an ATM, so I decided to keep going and get the lay of the land. I wandered a lot farther than I had originally planned, going a dozen or so blocks to the Chicago River which I then followed for a ways before turning back towards “home.” As I walked I was pleased to see sights such as the Tribune building and the Sears Tower: sights that said “Chicago” to me. That night I ate in the hotel restaurant (“Mrs Parks Tavern“). I was a bit surprised to see that the restaurant had a smoking section! After New York I thought maybe smoking had been banned in all major US cities, but I guess that the midwest still has some catching up to do in this area. In any case, the food was fine, and although I had my usual book with me to help pass the time, I didn’t end up reading. You see, there were six or so people dining at the table behind me who were apparently part of a film crew. I could hear them blocking shots for a scene that was to take place in the interior of a submarine, perhaps as part of a documentary. In any case, I couldn’t help but overhear, and that kept me interested enough that I didn’t need my book that night. After dinner I had a rather ordinary evening washing clothing and hanging it to dry over the tub, and watching a movie on the bedroom TV. The next day I was full of plans. First up, the Field Museum. In case you aren’t aware, it is one of the truly great natural history museums, and one of the largest in the world. It is located on Lake Michigan, west of downtown Chicago, alongside the Shedd Aquarium and the Adler Planetarium (which was my next goal). The museum complex was far enough from my hotel that I needed to take a taxi from my hotel. The taxi dropped me off right in front of the Field Museum; later I walked to the planetarium and then from there took a taxi back to the hotel. She’s standing right out in the main lobby area; you can’t miss her. The skeleton is very impressive, and nearly complete. Missing bones have been recreated using a dark material, so you can easily see which parts are real and which aren’t. On the skeleton the skull is a replica, but they do have the actual skull: it is in a nearby case where you can examine it more closely. 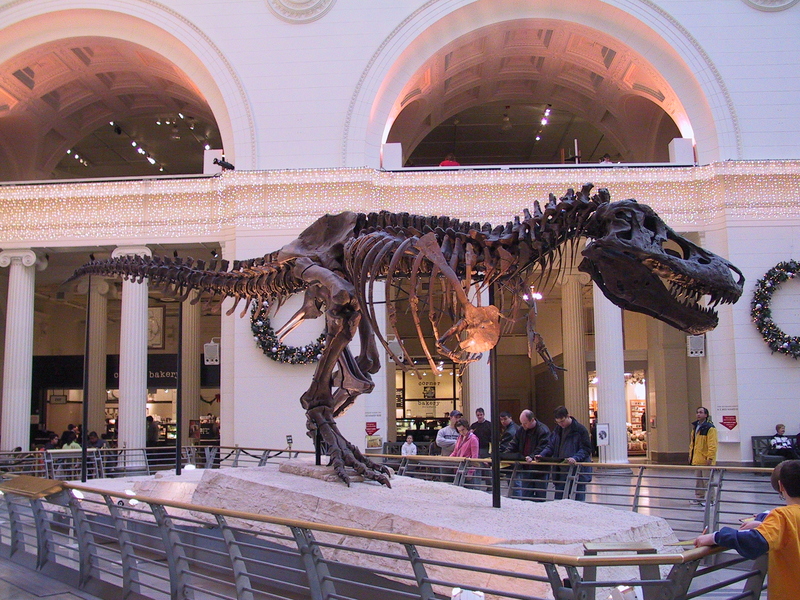 The Field Museum has a lot more to offer, of course. 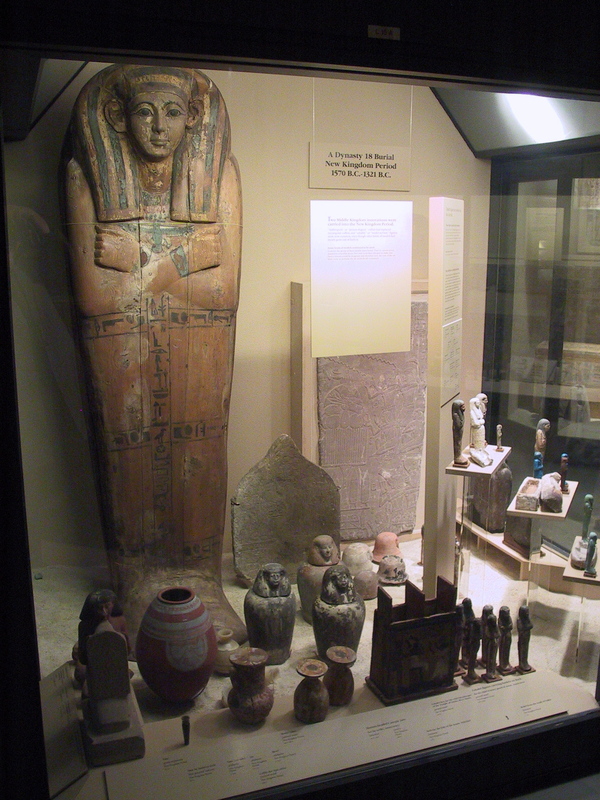 I really admired their tremendous Egyptian exhibit: they have parts of an actual tomb that you can walk through, along with an amazing number of mummies, statues, and carvings. The display was great and very informative: I spent a lot of time studying the artifacts and reading associated text. The planet Venus (which represents motherhood and birth) and Jupiter (which represents kingship) rose in Leo (a constellation associated with Judiasm), in the east, between 3 BC and 2 BC. Venus then faded while Jupiter rose and moved to the west. As they journeyed, Jupiter and Venus approached and retreated from each other three times. Jupiter and Venus combined in the west, over Jerusalem, appearing as a single bright object in the sky. As the wise men approached Jerusalem, Jupiter disappeared from view due to the position of the sun. Then, as they started towards Bethlehem (Herod sent them, based upon information given him by the prophet Micah), Jupiter became visible again, off to their left, and seemed to travel with them. If they approached the stable from the east, Jupiter would have been over the building. And if they then returned to Mesopotamia, Jupiter and Venus together would have been in front of them. It’s a little hard to explain in words, but the show did a great job of illustrating how the planets were moving at the time and what the sky would have looked like to the wise men. All of this movement of the two planets may sound a bit odd, but it is only because of how we view them from Earth: they were of course just making their usual orbits around the Sun. It just appeared as if they were moving back and forth and guiding the wise men to Bethlehem. This last show really got me pumped up, so I then went off to see their exhibits of old astronomical equipment. 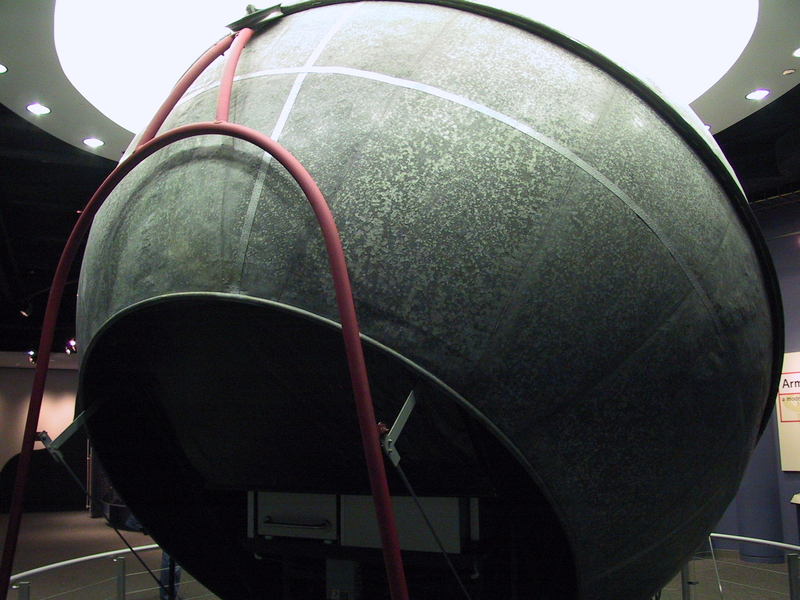 Being a lover of planetarium shows and the spider-like projectors that create them, I was especially taken by the Atwood Sphere, a true forerunner of our modern dome-and-projector setups. Built in 1913, it is a 500 pound, fifteen-foot diameter sheet metal sphere that has varying-sized holes punched in it to represent stars. Six or so people plus a docent ride in a little carriage that is chain-driven by a small electric motor up into the sphere. From the inside, it really does sort of look like the night sky. Light outside of the sphere penetrates the holes, allowing those of us inside to see the night sky on the inside of the sphere. 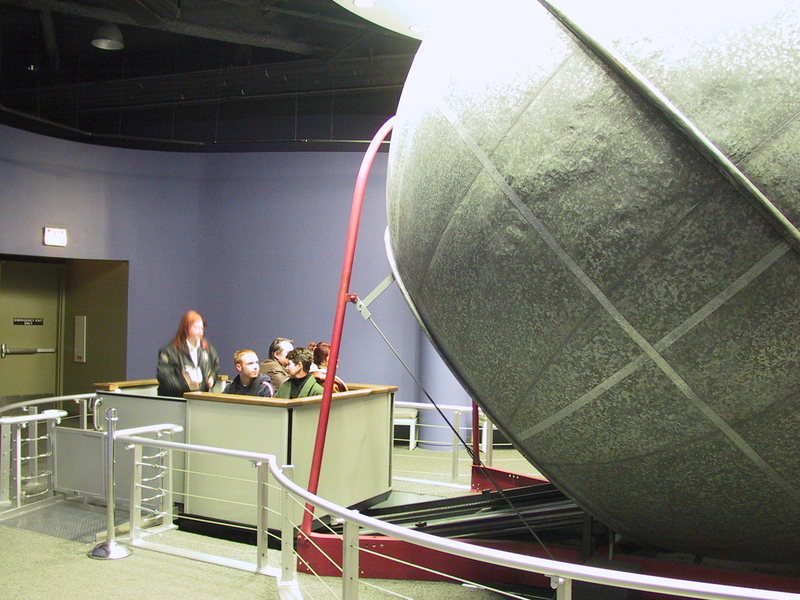 The sphere even rotates to show the progression of the stars across the night sky. It feels (and sounds) a bit like you are inside a cement mixer, but it works! This thing is a true must-see. Enraptured by all the equipment and displays, I pretty much stayed until the museum closed, and then, after taking a moment to admire the skyline and get a couple of pictures, I grabbed a taxi and returned to my hotel. The next day was much less structured: my whole goal was to do some last-minute shopping (I was getting home on December 20th, so Christmas gifts were at the top of my mind) and really explore the area on foot. Because this was also my last night not on the train, I wanted to find a particularly nice place to have dinner that evening. All throughout the trip I had been keeping an eye out for gifts for my wife and kids, and had been particularly successful in Florida: I found some great space stuff for the boys out at the space center, and I found a terrific sweater for my wife in the gift shop at the Norway pavilion in Disney’s Epcot. Although the sweater was terrific, the price wasn’t, so I hadn’t bought it there. Instead, when I hit New York I had found a retailer online who carried the same line of sweaters (at a much more reasonable price) and ordered one to be sent directly home. So by Chicago I had gotten at least something for everyone, but just to be sure I wanted to keep looking for additional gifts. In particular, my wife loves scarves, and given the weather in Chicago—and the caliber of stores that can be found along the “Magnificent Mile”—a scarf from Chicago seemed particularly appropriate. I did eventually find one, which allowed me to relax a bit and simply enjoy my exploration of the city. Dinner that night turned out to be just around the corner from my hotel: at The Grill on the Alley. This is a nice steak-and-seafood restaurant that feels like a classic old steakhouse (although it has only been around since the year 2000). Wood floors, leather seating, and white tablecloths set the mood, yet jackets and ties aren’t required (fortunately; I had the jacket, but not the tie). I had found the place almost immediately upon setting out that morning from my hotel and throughout the day kept comparing other restaurants to it. One thing that kept it high on my list as I wandered the city was its location: after dinner there I wouldn’t have far to walk to get back to my hotel. Thus, when dinner time rolled around it still seemed to be my best option, all things considered, so I returned to my hotel, changed into my best clothes, and headed over there for a lovely steak dinner. Then it was back to my room. Because I’d be back on the train the next day, finally heading for home, I used my last evening in Chicago (while watching another movie, naturally!) to lay out my clothes for the next day and get everything else packed up. At long last, my trip was nearly over I was about to go home! This entry was posted in Uncategorized on June 4, 2014 by Greg Wilson.